Reading The Underwater Welder brought several new experiences to me. Not only was this the first time I’ve read non-superhero comics by Jeff Lemire, but this was also my first digital graphic novel reading experience. While I found Lemire’s art stunning on the screen, I can’t help but think the hard copy format will provide an even more poignant experience. The Underwater Welder is the story of Jack and Susan Joseph, parents only weeks away from welcoming their first child into the world. Jack takes a rather unusual course in preparing for the birth of his child and heads off to an oil rig for an underwater welding job instead of remaining home with his heavily pregnant wife. A seemingly supernatural occurrence on the ocean floor ends his assignment early, but furthers his distance from his wife and unborn son as it launches him on a journey of self-discovery tied into his relationship with his own father. Lemire takes his readers on a strange and beautiful journey that will pull at your emotions regardless of your relationships with your own parents or children. Within the pages of The Underwater Welder a black, white and gray world is created, adding depth and weight to the relationships of the characters and their surroundings. My words cannot do justice to the beauty of Lemire’s inks. There is literal and figurative depth here, but also subtlety when it is needed. As I mentioned, I haven’t read Lemire’s non-superhero comics before, but I’m curious to see how he’s grown over time, and where he might go next. I’m very much looking forward to picking this book up in hard copy so that I may appreciate the splash pages the way they are meant to be enjoyed, side by side in their full glory. 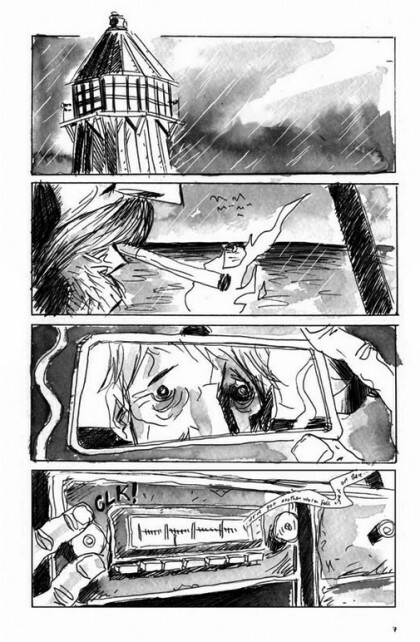 Lemire puts so much soul in a what seems like a simple panel of a diver viewed underwater from afar. He also accomplishes seamless transitions in both time and place as he progresses the story with a well-timed pace. One of Lemire’s more striking pages combines images from our protagonist’s past and present as air bubbles surrounding a clearly panicked diver. It’s always exciting to discover a new comic that manages to be a moving work regardless of how much or little you might know about the subject matter. Comics like this provide a great opportunity to introduce non-comic readers to the potential of the medium. Here’s a story about life experiences that most anyone can relate to, moving beyond the tights and capes that many non-comic readers struggle to overcome in their feelings about this medium. 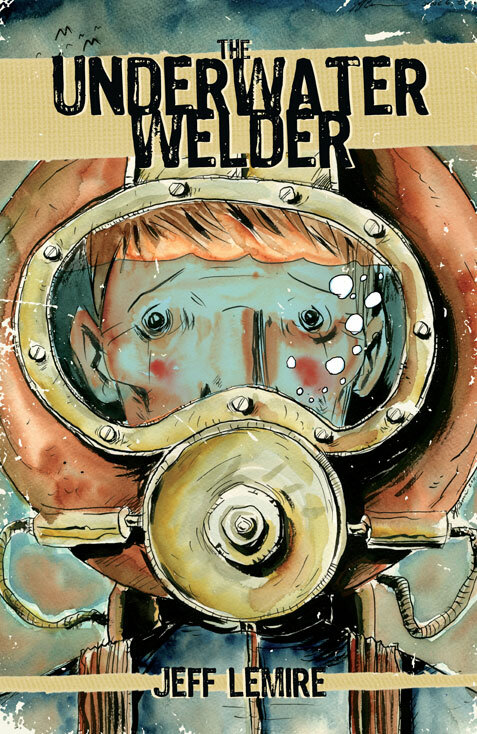 Not only will The Underwater Welder be occupying a space on my shelf in August, but Lemire’s latest novel has inspired me to go back and read his earlier tomes as well.